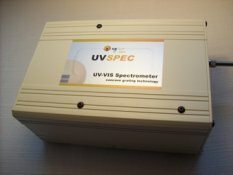 The UV SPEC is a UV-VIS spectrometer which measures in the range of 200 nm – 800 nm. It features a fast integration time of 2 ms and high linearity due to its concave grating. The spectrometer is shock proof due to there being no internal optical adjustments.